KING BUGS: Here he is, the star of "That's All Folks: The Art of Warner Bros. Cartoons," which opened April 23 at the James A. Michener Art Museum, in Doylestown and will be on view through July 3. For this show there will be a $4 charge in addition to regular museum admission, which is $6.50; senior citizens age 60 or older are $6; students are $4. Members and children under 6 are admitted free. The museum is located at 138 South Pine Street in Doylestown. Gallery hours are Tuesday through Friday, 10 a.m. to 4:30 p.m.; Saturday 10 a.m. to 5 p.m.; and Sunday, noon to 5 p.m. The museum will be open until 9 on Wednesday evenings. For further information, call (215) 340-9800 or visit www.michenerartmuseum.org. The past few shows at the Michener have offered museumgoers quite a ride, from the razzledazzle of Red Grooms to photographs of the Nazi Camps to Looney Tunes and Merry Melodies. Two months ago the Lower Gallery was hushed, the walls haunted by stark black and white images from the crime scenes of the Holocaust. Now the imagery is no less stark but vibrantly bright, the walls are ringing with primary colors out of Saturday matinee America, and the rooms echo with the voices of children whose parents are treating them to an early taste of art gallery manners while offering profound pronouncements such as "I don't like Porky Pig" and "I feel sorry for the coyote." As for the kids, they're too young to have grown up with Bugs Bunny and Daffy Duck, though they obviously know them from the endlessly available cartoons on cable TV. And, no surprise, Bugs Bunny's the favorite, just as he was between 1945 and 1960 when Warner Bros. was producing the most popular cartoons on the market. That "wascally wabbitt," King Bugs, the master of mayhem, the looniest of the lot, also happens to be the natural enemy of pomposity and high art, including, of course, attitudes associated with the realm he rules at the Michener's exhibition, "That's All Folks: The Best of Warner Bros. Cartoons." Bugs Bunny began cavorting on movie screens during the Second World War. While the death camp horrors were taking place, he was featured in The Fighting 69th, Herr Meets Hare, and Bugs Bunny Nips the Nips (the Michener show includes a drawing of Bugs as a geisha from that one), which inspired critic Manny Farber to call him, tongue somewhat in cheek, "a one-animal advertisement of the moral that unadulterated torturing of your fellow man pays off." Meanwhile, the morale of combat-weary American soldiers was being at least temporarily revived as they watched Bugs put his adversaries through hilarious caricatures of warfare (Bugs says "this means war" and "them's fighting words" almost as often as he says "What's up, Doc?"). In fact, the dynamic driving the most successful Warner Bros. cartoons was conflict: Porky Pig vs Daffy Duck, Bugs vs Elmer Fudd and Yosemite Sam, Road Runner vs. Wile E. Coyote, Sylvester vs. Tweety Bird. Another of Manny Farber's pronouncements (this one quoted by the show's curator) was that the best of the Warner cartoons are "masterpieces." The items on the gallery walls, however, are not masterpieces but sketches and notes and rough drafts. The lightning in a bottle that is Bugs can't siphoned into a frame and hung on the wall minus that smart-aleck Brooklynese accent and those hyperkinetic moves. The art that propels Bugs is motion and sound, which means that the artists credited on many of the works displayed  cartoon auteurs like Chuck Jones  are mentioned not because they actually sketched or painted the images but because they brought them to life and set them in motion against backgrounds painted by artists Paul Julian, Richard Thomas, and Philip DeGuard. Fortunately, the organizers of "That's All Folks" have wisely provided the necessary dimension of action and sound (imagine Bugs Bunny without the voice of Mel Blanc). Last Saturday people could watch non-stop Bugs Bunny cartoons onscreen, complete with the all-important audio equivalent of chaos. Rather than sitting down right away to watch Bugs destroy painfully pompous matadors and fat preening opera singers, however, you should walk through the gallery first while the familiar cartoon soundtrack creates unrelieved sonic pandemonium in the background, the perfect accompaniment as you look at the raw material that, no matter how brilliantly done and displayed, is only the stuff of a work in progress until it hits the screen. When you sit down and watch the cartoons after walking through the exhibit, you'll appreciate all the more how skillfully the bright, static elements you've been gazing at have been assembled and ignited. Watching Bugs in action brought back the special joy kids experienced before the era of cable and the multiplex. Imagine how it felt after suffering through a plodding travelogue and some only marginally tolerable short subjects and previews to see that bright zany bunny face surge into view on the screen with the familiar jaunty wake-up-everybody theme music. A classic example shown at the Michener last Saturday opened with Bugs innocently strumming a mandolin and singing a song that distracts the aforementioned fat pompous opera singer so much that the aria he's rehearsing becomes infected with Bugs's June-moon-spoon nonsense. The opera singer forthwith hammers the bunny with the mandolin, upon which Bugs says, "I hope you realize this means war." The tortures thereafter inflicted on the opera singer culminate in an opera house performance during which Bugs disguises himself as the conductor Leopold Stokowski (complete with long hair) and reduces the singer to red-then-blue-faced writhing agony by having him sustain a single note beyond human endurance. Bugs even goes off to do some other mischief while leaving his white conductor's glove suspended in mid-air, still commanding the thrashing virtuoso to hold that note. Here is where Chuck Jones and company carry you over the top. You don't have to be nine again to enjoy the effect of that lone white glove, not to mention the terrific graphic crescendo that comes when Bugs brings the entire opera house crashing down on the singer's head. "That's All Folks" provides a sense of the collaborative nature of cartoon-making through the model sheets containing numerous provisional images of Bugs, Tweety Bird, and Elmer Fudd with suggestions pencilled at the appropriate places, such as Tweety's backside ("perky fanny") and beak ("keep bill small"). For Elmer Fudd, it's a "large fanny" and "small chin." 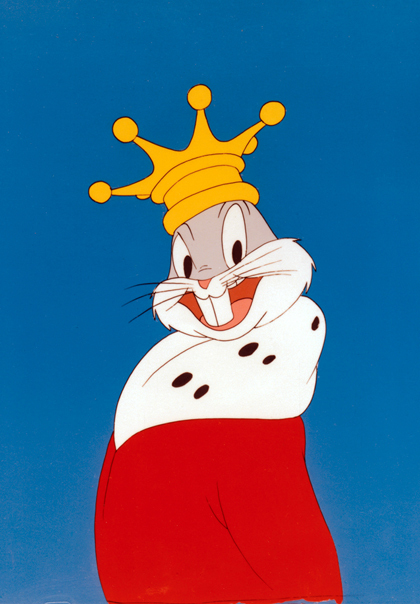 For the mature Bugs (in his earliest incarnation he resembles a cute, cuddly Disney bunny): "keep line of body action simple," "draw ears to suit mood, whiskers, too," "keep ruff on cheek high: it makes him look younger," "lots of teeth when necessary," and "large flat feet, long hands and fingers." The painted backgrounds are among the most interesting things on display. One worth mentioning is Richard Thomas's background painting for The Unholy Hare that depicts railroad tracks running into the moon against a deep blue sky, and Philip DeGuards's painting of a boxing ring from an unorthodox angle with cigar-smoking men in the foreground. Another thing that becomes clear the more you see of the exhibit is how resolute the Warner artists are about avoiding the Disney look. Some rejected images of Daffy Duck on view appeared dangerously close to being clones of Disney's Donald. Longtime Warners storyman Michael Maltese is quoted as saying the secret of their success was that they made "cartoons for adults"  as opposed to what the Michener commentary calls the "soft, sentimental storybookish" world of Disney. However different they may be, Warners and Disney had the same goal in common: making people of all ages laugh. Laughter equals acclaim, the ultimate justification of a complex, long-term effort. According to notes accompanying "That's All Folks," a six-minute cartoon could occupy more than a dozen artists for anywhere from several months to as long as a year. In another current Michener exhibit, "Playing Around," which features toys designed by artists, sculptor Alexander Calder is quoted as saying "Art should be happy," an idea similar to the one developed in Preston Sturges's 1941 film, Sullivan's Travels. Sullivan is a popular director of romantic comedies who wants to make a serious "message" picture (the title he plans to use was borrowed by the Coen brothers a few years ago for O Brother Where Art Thou?). While living like a tramp in order to soak up material, Sullivan lands in a chaingang where the men are treated to a movie after a hard day's work. A Disney cartoon comes on, Pluto having a bad day, and as the exhausted, despondent Sullivan looks around at the other exhausted, despondent convicts in the audience coming alive with laughter, he realizes the value of his gift for comedy. He experiences it himself, laughing out loud as the hapless Pluto becomes more and more entangled in cartoon chaos. Alexander Calder's idea of "happy" is actually closer to W.B. Yeats's theme in Lapis Lazuli: gaiety transcending comedy and tragedy. Thus, while "Hamlet rambles and Lear rages," Bugs Bunny brings down the house and the opera singer lives to perform another aria.